In Katherine Pappas-Parks’ haunting painting “Flying Though Moments Feeling the Earth Turn,” a delicate yellow bird with red-framed eyes perches on a transparent glass ball. A sinuous black cat turns its head, its legs casting long dark shadows. A pink bird blends in with the petals on a flower filled bough. In the distance, green hills resembling mounds punctuate the blue sky, one tree piercing it like a needle. Stillness reigns. Animal, bird, flora and fauna luxuriate in this world, as they do in all her works, whether she changes the sky from blue to soft pinks and yellow, or brings a yellow bird to the foreground as she does in “They are Said to Contain the Treasure of Age III,” where big, mysterious, blue mounds fill the landscape. She extends an invitation into this magical kingdom. You soon realize looking at Pappas-Parks poetically titled paintings that she has discovered something that she wants to share, a place of profound and simple beauty. Entering into them is as much a physical as an aesthetic experience. She tantalizes us. Beyond being brilliant at her craft, she coveys ideas, moods, and emotions that expand our understanding of art’s capabilities, and lead us into unchartered territory. Growing up in Detroit, she learned to see art in all things from her mother who would develop designs for her embroidery from everything around her. Her father gave her an appreciation for nature. He would wake her in the mornings to catch sight of a raccoon or rabbit in the backyard. Attending the Greek Orthodox Church, she savored the smell of incense, and would lie in the pews to look up to the lushly colored paintings on the ceiling. All these influences converge in her art, as well her Greek-American heritage, her travels to Greece and Italy, and her philosophic affinity with the surrealists, writers of magic realism like Gabriel Garcia Marquez and Jorge Luis Borges and the French painter Pierre Bonnard, whose rich colors she loves. Pappas-Parks has worked long and hard to achieve the high level of intensity found in her paintings. She began with pastels, watercolors and printmaking before finding in paint her true love. “I connect with paint,” she says. “I love its texture. 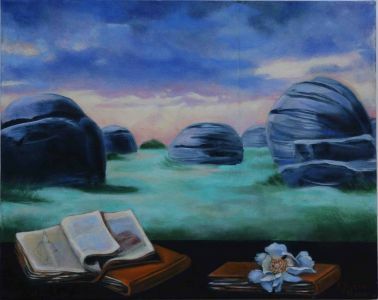 I love its smell.” Eventually, she came to realize that she could combine the two styles of painting with which she felt most kinship – landscape and still life. How could anyone not be drawn into “One Moment is Timeless as the Flying Birds Know”? The sky glows warm pink. The hills and grass look as soft and sensual as velvet. 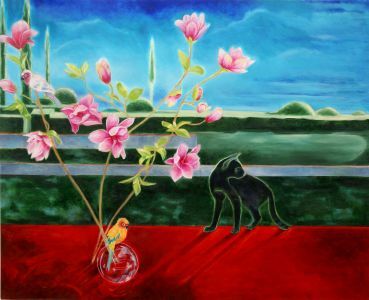 The stems of the pink flowers stretch out languorously in different directions, and a yellow bird sits poised on a glass globe, quiet and alert. She leaves space for us to enter into this place. Though Pappas-Parks has taught art in schools and colleges all her life, she does not want to instruct viewers as to what they should see in her paintings. “I hope they will imagine their own narrative,” she says. “The images have specific meanings to me. But I want viewers to be free to make up their own.” She doesn’t have to urge us; they set fire to the imagination.